Ashbourne Telegraph review of the concert. Seasonal songs entertained the audience at St John’s Church when Ashbourne Singers and their younger counterparts gave voice to celebrate Christmas. 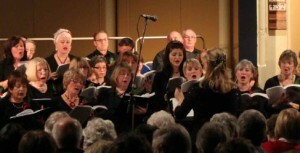 More than 100 singers performed in the concert which featured a mix of traditional carols with more contemporary arrangements. 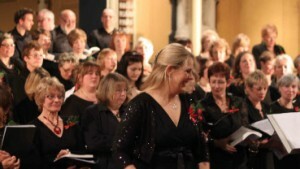 YAS gave stirring performances of ‘Silent Night’ and ‘Walking in the Air’ accompanied by the adult choir. 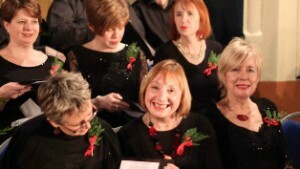 Particular favourites of both the choir and audience were ‘The First Noel’/Pachelbel’s Canon’ arranged by Michael Clawson, Bob Chilcott’s ‘The Marvellous Birth’, and a Barber Shop rendition of Winter Wonderland arranged by Steve Duckworth, who supported the choir on the piano that evening. Michael Halls accompanied on the organ and flautists Mel Gill and John Barber beautifully decorated the First Noel. The Ashbourne Singers perform regularly in the area and this was their fourth Christmas Concert which was well supported by a full church.